Amazingly, I am really nearly ready for Christmas, all the presents are wrapped, we have had the Watt (my family) Christmas, and we are not hosting the Lewis family Christmas. Mark might think this was an excellent opportunity to do my tax return, but I think I would rather update my blog and watch Olympia. Luendi and Espirito Santo continue to be excellent babies and have now been to shows at Felbridge, Royal Leisure, Addington and Patchetts and we no longer need to do the clear round and have even graduated to jumping Discoveries. Luendi has scored the first double clear to be 2nd in the British Novice at Patchetts, but Espirito Santo won't be far behind. Emma is now really back up to speed. She has been to several shows, the first at Royal Leisure where she just did a very speedy (not entirely intentionally) round in the 1.05, I then took her on her own to Crofton Manor where they have a 1.10 open which is a better level to start her at. The working in area at Crofton is big which is much easier on Emma, and was slightly less wild for double clears in both the 1.10 and Foxhunter. However, when I tried my luck back at Royal Leisure she was a nightmare, running me to the fences and crashing two down. This left me feeling very low and rather missing Wayfer and Biscuit. Shane is still away at shows a lot, so very kindly David Simpson agreed to give me a hand to identify what was going wrong. Shane, David and I have all agreed that this is a good idea, and it works particularly well as David and I are both trained by Shane. The problem was an old one: if I don't have a big enough rhythm round the corner Emma tends to panic and try and run to the fence meaning that I don't have much choice over the distance we go on and have to push her on what we have got making the problem progressively worse. When I am stronger into the corner I can then hold the impulsion to the fence letting Emma's hocks come underneath her and getting a really good distance to the fence. I took Luendi and Espirito Santo to David as well, giving them the opportunity to see another place and some more new jumps, and having the first input on how I am getting on with producing them. They both jumped well, if greenly, and were judged ready to go to Addington. After a three and half hour journey round the M25 Espirito Santo and Luendi both went straight round the British Novice and Discovery, for a few faults when they got in a muddle. Emma was very difficult in the working in, but jumped a really good round in the 1.15 to be just out of the money. The following Monday saw me tackling the M25 again en route to Patchetts. Emma jumped really well in both the 1.10 and the Foxhunter, she is still tense in the warm-up, but seems to be settling much more quickly in the ring. Espirito Santo and Luendi both jumped straight round the British Novice, Luendi coming second with her double clear and Espirito Santo just getting a bit close to once fence. We have been back to David for another lesson, this time in the pouring rain, and all the horses jumped really well. The babies are sufficiently forward now that I can concentrate on keeping a big rhythm and a good distance to the fence, rather than wondering whether we are going over the fence at all. Emma jumped brilliantly too, but by then I was so wet and the saddle so slippery that I was shooting around like a piece of soap and we had to quit before I shot off. Another year over: I never seem to make quite as much progress as I would like, and am not very good at looking back positively. One of my aims for 2013 was to feel more competent at 1.30 and I think I probably got there with Wayfer in Auvers. 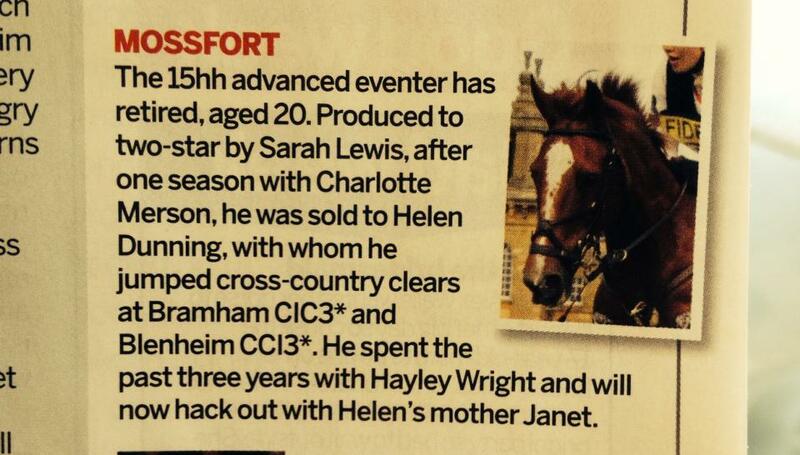 Emma jumped several six year old classes at 1.30, so hopefully 2014 might actually bring some more 1.30 placings. Luendi and Espirito Santo are off the starting blocks now, they are easy and fun to ride at home and very well behaved at shows, so we can now concentrate on our technique as the jumps start to get bigger. The lovely Mossfort (Hungry) who gave me my first taste of international competition retired at the end of the eventing season. He was a wonderful servant to me, and later to both Helen Dunning, with whom he was successful at CCI3* level, and Hayley Wright with whom he was placed in a very hot OI section at his last event. Happy Christmas and Happy New Year to everybody.